Rice lake is located about 50 miles (80 km) east of Toronto, once known for it's wild rice cultivation, the lake is very shallow (max. depth is 27 ft.). Weedbeds and sandflats are abundant and attest to the lake's great fertility. Panfish abound in these waters and provide food for the highly sought after predatory fish, such as bass, walleye, and muskie. Fishing is excellent on Rice Lake and anglers from all over Ontario and the USA, visit the lake annually. You can access Rice lake via the public launches located in Bewdley and Hastings. In spring, Rice lake walleye can be found scattered in the weedflats around Bewdley, cast a silver rattle spot, retrieve at medium speed in 5-8 ft. of water, try to cover a lot of water, this area is quite large. If the bite is off, try trolling in this area with a chartreuse worm harness. Also fishing the mouth of the Otonobee River, where it spills into the lake, use jigs tipped with worms or minnows, in the deeper holding pools off Jubillee Point. 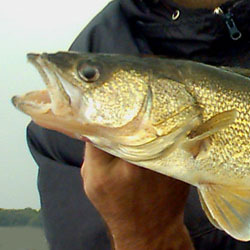 Rice lake pickerel/walleye average 1-2 pounds, although some lunkers in the 5-6 lb range are not uncommon. In summer, the walleye school in the deeper channels on the south end of Rice lake, just out from Gores Landing, troll slowly with chartreuse worm harness in 17-21 ft. Once you catch a walleye, anchor, and try fishing with jigs tipped with bait. Also fishing the waters near Tick island and the old railway line can be productive. Rice lake walleye can be difficult to locate in summer, fishing the pockets in heavy weeds, with white jigs, can be very rewarding. Largemouth Bass fishing is quite common in Rice lake, and Professional Bass Tournaments are held yearly. In summer largemouths are concentrated on the weedflats north of Bewdley. The weeds are high at this time of year, and they may choke the entire south-west bay. Look for clearings and pockets in the weeds and cast texas-rigged worms or plain jigs into the holes, motor-oil and smoke colours work best, use heavy line 14 lb. test and up, once again cover lots of water, check the weeds near 6-8 ft. of water. The mouth of Otonabee in the stumps off Cow Island is also a good bet. Go up Otonabee and fish the Lily pads near Bensfort Bridge, use frog imitations like the pop-r and snagproof sally. Rice lake bass can grow huge, many fish in the 5-6 lb range are caught annually, although the average largemouth is 2 lbs. Smallmouth bass can be caught in the deeper areas of Rice lake in 15-17ft of water. Fishing the drop-off created by the sunken railroad near Tick Island is a prime smallmouth area. The many rocks from the old railway attract crayfish, the smallmouth's favorite food. Crappie fishing on Rice Lake can be fantastic at times, especially in the spring. Crappie in excess of 1 lb are quite common and are excellent table fare. Best baits include small tube jigs under a float and small spinners. The colour of choice is white or chartreuse. Fishing weed edges and pockets can be very productive, especially when the crappie are schooling. Please check the regulations for limits. Rice lake is famous for it's Muskie Fishing. With the abundance of panfish, these predator fish grow huge, with some fish tipping the scales in the 30lb range, although 10-15lb Muskie are more common. The best method to catch Rice lake muskie is by trolling. Cover lots of water along the deeper channels on the south end of Rice lake. 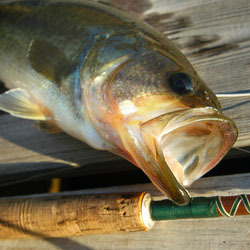 Use large body baits in perch patterns for best results, 6-9" crankbait lures give best results. Also casting large bucktails along weedlines especially on windy days can be very effective on Rice lake musky. I've just recently been fishing rice just north of roseneath and have had lots of luck with largemouth bass and walleye. Fish any of the islands on the tips anchoring in 12-15 ft of water and fish the slope in 20-26 ft with jigs and power baits, drag the jig slowly up the ledge occasionally with a pop and good results will happen. You have to work the area very thoroughly as the fish seem to be scattered at this time of year. The main thing is to go very slowly. I boated a 4.8 lb largemouth and three walleye the largest being 3.3 lbs, also picked up 6 crappie and perch. Angler's Fishing Tip#2 I've fished Rice Lake for many years and the spot that my Dad and I always head to is located in between the Otonabee River and the Hiawatha Indian Reservation, (the old sunken railway line). There is a white church probably about a mile or two from the marker bouys towards the river and if you fish about 100 to 250 yards from shore it seems to be a great spot for walleye and perch, We`ve always had great luck with the fishing in this spot. Try it out some time I don`t think you`ll be disappointed. Take care and good fishin'. Each detailed map provides depth, contours, structure, boat ramps, and updated fishing information. Rice Lake fishing maps also include lake info such as gamefish abundance, forage base, water clarity, weedline depth, bottom composition, complete latitude/longitude grid lines and dozens of GPS waypoints & coordinates.